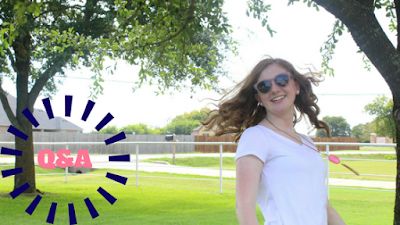 Life as Pink Einstein | Dallas Fashion and Lifestyle Blogger: Answering Your Questions! I got a lot of questions on Instagram (follow me @PinkEinstein) and today I am answering them! When did you first start a blog and why? I first started my blog in 2013 and I honestly have no clue why I created it. I didn't have a plan for this blog when I created it or even know what I wanted to post. I abandoned this blog soon after creating it because like I said, I had no plan as to what I wanted to do with it. Christmas 2015 I got a Canon camera and started going out and taking pictures and wanted to share them so I put them on here. When and how did you figure out you wanted to be a fashion blogger? I've always loved clothes and fashion and in spring 2016 I started taking pictures of my makeup and clothes and I really enjoyed it and started to read fashion blogs and realized that's what I wanted to do with my blog. Like I said, I honestly have no clue. My favorite thing about blogging is creating posts and having people read them and enjoy them. My favorite time of day is the evening because dinner is my favorite meal of the day and the sunset is one of my favorite things. I like sunny weather where you aren't going to sweat your makeup off but it's still warm outside and there's a little bit of breeze. For tee shirts my favorite brand is Jadelynn Brooke (use my code SLMHS for 15% off their website) and for everyday clothes my favorite brand is Old Navy or Lilly Pulitzer. My favorite accessory would have to be my pearls. How do you take and edit your Instagram pictures? I typically take my pictures on my Canon Rebel t5 and occasionally I use my iPhone SE. To edit my pictures I use the app Color Story and I bring the brightness and saturation up just a little bit. My tips for new bloggers would be to make sure you have at least one picture per post and make sure that your pictures are good quality (good lighting, not blurry, and that there's not junk in the background), make sure your blog looks nice by adding a background and header that fits your blog's theme and that there isn't a lot of unnecessary things added to your blog, and my last tip is to write a blog post (and an about me page) telling all about yourself and what to expect on your blog so your readers can get to know you better. My favorite store is Old Navy. My go-to outfits for school would be a striped boat neck shirt, cuffed jeans, and Jack Rogers or a striped tee shirt dress and Jack Rogers. In the summer my go-to outfit is printed chino shorts and a cute tee. Is there a reason you always wear sunglasses? Originally I wasn't allowed to show my face at all on my blog because of safety reasons but I really wanted to start posting outfit pictures so I came to a compromise with my mom so now I am allowed to show my face in pictures as long as I'm wearing sunglasses.